- To make the paint, you simply mix the powder with warm water. Each bag contains 6 oz. powder and makes one pint when mixed. One package will cover 36 sq. ft., which is approx. 2 smaller dressers, 1 small hutch or 5-6 chairs. How far the paint goes will depend upon your painting technique, how thick/thin you mix the paint, how many coats you do and the contrast between the color your are painting compared to the piece your are painting. - Milk Paint can naturally chip or crackle when applied over some existing finishes. This can result in an authentic look reminiscent of a chippy/aged/timeworn piece of furniture. 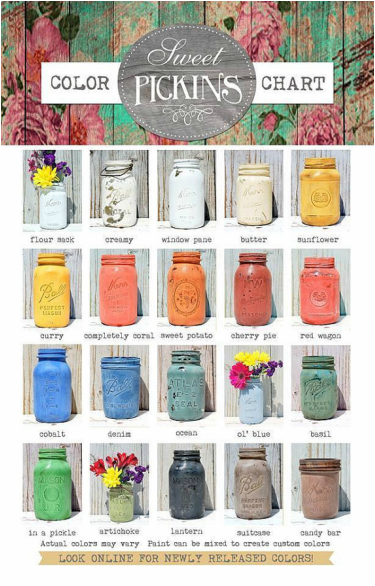 - Sweet Pickins Milk Paint colors can be mixed together to achieve your own custom colors. You can also add white to lighten or black to darken. Remember to keep your ratios if you want to recreate the color! - Sweet Pickins Milk Paint can be top coated with any available product on the market, although the most popular today is wax. To protect milk paint from water spots, it must be top coated. - Many variations in color and texture naturally occur on milk painted pieces and this is completely normal! These unique variations which only come with true milk paint, add depth and dimension to each project. - You can use the same techniques for distressing and glazing milk paint as you would any other paint. Don’t be afraid to experiment! What is it?Extra – Bond is a water based polymer emulsion. When added to milk paint, it gives greater adhesion to non-porous surfaces or previously finished pieces. Its environmentally safe, non toxic and VOC free. Clean up is easy since its a water based product – just simple soap and water will do. How to use it Using the Extra Bond is really simple because there are no extra steps involved! Extra – Bond only needs to be used on the 1st coat of paint. When using the bond in your 1st coat, it is recommended that you wait 2 hours before applying the 2nd coat of milk paint. If you re-coat sooner, it may re-activate the bond from the 1st coat and cause the 1st coat to lift. I don’t always wait the 2 hours and I’ve never really ran into this problem. And the best part about using the Extra – Bond, you don’t need to prep your piece by sanding!! The bond does the work for you! That’s one of the main reasons i love working with milk paint. It should be noted though, that if you are painting a piece with a high shine to it, that you lightly scuff sand it to knock down the shine and give the piece a little “tooth” for the paint to better adhere. When & Why to use itLike i said above, it is recommended that you use Extra – Bond when painting over a previously finished piece (polyurethane, shellac, waxed) or something that has already been painted. Same goes for painting over laminate, metal or glass. Basically if it has any bit of shine to it, that’s when i determine if i am going to use the bond. You can paint cheap laminated Ikea type furniture with it as well (although i would sand it 1st to give it some tooth and add more Extra – Bond than recommended). Also – if you want the look of milk paint, but don’t want a chippy, distressed finish then you would want to use the Extra – Bond. Waxes and Brushes. WhY and How? 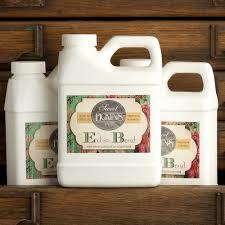 Our soft wax is the perfect wax for protecting your milk painted pieces. Because the wax is soft, it makes it so easy to use. Wax goes on soft but then dries to hard protective coating. The wax can be buffed to a high shine if desired. - After you have completed your painting with the Milk Paint, light sand your piece to smooth out the milk paint and remove any chips that may have flaked off during drying. - Its best to apply the wax with a wax brush so you can get into all the nooks and crannies of the piece as well as making it easier to get a nice, even coat. Work in sections as the wax dries quickly. Remember, a little wax goes a long way and you only need a very thin coat. This 16 oz tin should last you through several projects. - After you have applied your wax in a section, wait about 3 minutes and then buff to desired sheen level with a soft lint free cloth. - You can apply more coats if you would like a higher sheen. - If you are applying a dark wax, you must 1st use the clear wax. - If your wax is cold, take out a small amount and put in a microwave safe container and cover. Heat until wax is soft, it will be easier to work with. You can also leave the wax out in the sun to liquefy the wax, a lot of people prefer using the wax as a liquid. But remember, once the wax has liquified, it will not go back to a solid state. - You can also thin your wax with mineral spirits to use as more of a glaze, the spirits will evaporate just leaving the wax behind on your furniture. - To clean your brushes of the wax, use our Little White Lye brush cleaner. - If your piece gets scratched, simply apply a small amount of wax on that part and rebuff. Introducing WAXWELL™! 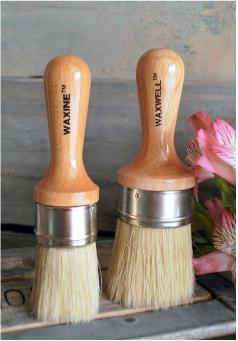 Waxwell is a 2″ diameter KingSized brush (Waxine™ is Queen at 1.5″). Inspired by an old-fashioned shaving brush, with a shorter handle so that the brush would fit into tight areas as well as a comfortable and ergonomically designed tapered lacquered handle for long-term comfort. The ferules are hand nailed and rust resistant. The two-inch long natural bristles are firm and resilient and designed specifically for wax. 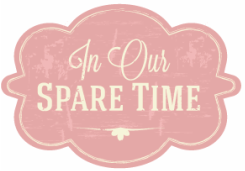 We recommend cleaning with our natural soap (Big Fat Lye or Little White Lye) and occasionally deep cleaning with low-odor mineral spirits, if needed. A care card is included with every brush so that you will know how to keep your brushes looking and performing great throughout countless projects.